SINGAPORE (THE NEW PAPER) - It was a reckless stunt, one that earned him not just lots of online vitriol, but also trouble with a supercar owner. Last Saturday, mountain biker Izzadnaff Abdul Qusyairl, 15, spotted a yellow Lamborghini Gallardo parked outside Bedok Stadium when he was on his way to the community centre to play computer games. Having seen a BMX video showing a famous YouTuber jumping onto and cycling over the roof of a car a year ago, Izzadnaff decided to do the same. "When I did it, I never thought of the consequences," he told The New Paper yesterday. He should have. When the owner of the car later posted online a video of what the teen had done, it went viral, getting up to 272,000 views, 3,800 shares and more than 350 comments. The boy has a bright future ahead of him and I know if I were to blow it up, it would have severe consequences. There were many negative remarks online as well and I felt they were really unnecessary. Many condemned the teen's stunt, and some went on a witchhunt to expose his identity. Thankfully, the owner of the Lamborghini, Mr Aaron Rylan Keder, 28, forgave him and decided not to seek redress from Izzadnaff's parents. Mr Aaron told TNP yesterday: "I met the family on Sunday afternoon and we have resolved the issue. "All I wanted was an explanation from the boy and to know how he felt when he went on top of my car. "I also wanted him to know that what he had done was wrong and not to repeat it." An avid biker, Izzadnaff has participated in many cycling competitions since he was seven years old. He even received the Peter Lim Scholarship as a mountain biker in May, which was aimed to fund sports scholarships for those from financially-challenged backgrounds. When asked how he felt about the entire episode, Izzadnaff said he was remorseful for his actions. "I am really sorry for the hurt and inconvenience caused upon Mr Aaron and my family," he added. Madam Azizah Mohd Putih, 45, a housewife, said she was angry with her son. She said: "Izzadnaff is usually obedient. I don't know what happened to him that day. "He was very afraid to admit to his mistake after that, but I told him that he had done something wrong, so he had to stand up and admit his mistake." Madam Azizah said she then tried to contact Mr Aaron via Facebook on the same day but did not receive any reply. She managed to get his telephone number from a mutual friend afterwards and contacted him the following morning. She said: "I didn't know what was going to happen next, all I wanted to do was to let my son apologise to the car owner." The family successfully contacted Mr Aaron, a businessman, and they met to settle the matter. Mr Aaron said: "The boy has a bright future ahead of him and I know if I were to blow it up, it would have severe consequences. "There were many negative remarks online as well and I felt they were really unnecessary. "Izzadnaff apologised when I met him. I knew he was really sorry about it." Mr Aaron said he has not sent his car for repair due to his busy schedule. "I don't know the exact damage, but I think it might have affected the body kit," he added. A cyclist who wants to perform a stunt has to do it at designated areas such as skate parks and perhaps trails, not in areas like public carparks. The public should call the police if they witness such occurrences. In giving this advice, Land Transport Authority's Active Mobility Advisory Panel member Denis Koh, 44, noted that safety helmet and padded gear are highly recommended. 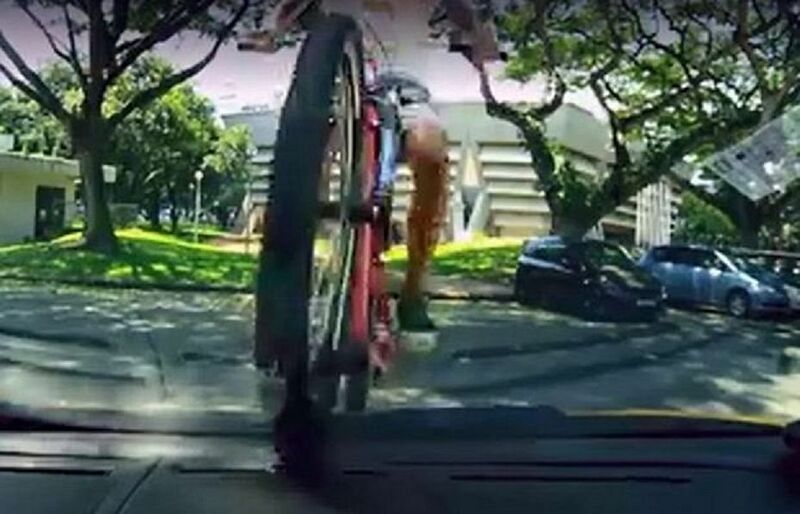 Safe Cycling Task Force president and Singapore Cycling Federation for Safety and Education vice-president Steven Lim, 49, said what the teen did was irresponsible, and that he had disregarded his own safety as well as that of others. "I believe that when we commit any act, we need to consider if we want others to do the same to us first," he said. "Safety is a personal responsibility but road safety is a shared responsibility." Mr Lim also noted that many people have stereotyped cyclists as law-breakers, like those who beat red lights. "We are very concerned about this, so we have been giving safety talks as we do not want one or two people to bring down the entire community."